On the tail-end of a whirlwind long weekend to Moab, my Dad and I were driving hastily through the high desert plateau country back to Flagstaff. As we crested the top of the Lime Ridge on highway 163 just north of Mexican Hat, Utah, my dad pulled off into a roadside pullout, and we stepped out of the cab of the truck into the elements. As we discussed the geology of the Lime Ridge and Raplee Anticlines beneath our feet, a cold wind sent a chill up my spine. A storm was brewing on this November afternoon. Peering south beyond the muddy waters of the San Juan River, I could see the distinctive buttes of Monument Valley rising in the far distance. At that moment I had a gut feeling that a stop at the Mittens overlook could be an excellent idea. As we approached the turnoff to enter Monument Valley, a break in the clouds was forming, and the sun was making a beeline for the opening. I made the executive decision to head to the Mittens. 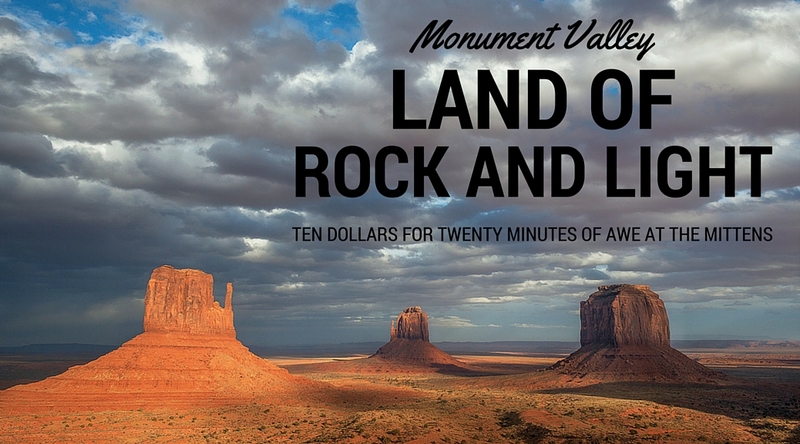 At the entrance, we were charged the $10 fee required for two people to enter the Monument Valley Tribal Park. I was expecting to pay $5, and I gulped hard as I dug another Abraham Lincoln out of my wallet. I wasn’t about to make my Dad pay so I could take a short photo stop, but I hoped I was getting my money’s worth. Pulling up to the classic spot at Ansel Adams Rock, the landscape was distinctly different compared to our previous stop at this overlook. West Mitten, East Mitten, Merrick Butte and all other monuments were as we had seen them before, but a dirt track had been replaced by an asphalt parking lot, complete with lamp posts. Pavement had been pushed within 15 feet of Ansel’s Rock. Our stomachs churned with the sight of this abomination. Oh well, such development is common in the Southwest. My dad pulled into a painted parking spot, and we walked ten yards over to the edge of the hill. The cliche view of the Mittens were laid out in front of us. It’s a scene I have seen a thousand times in photographs. It was only my second time seeing the place with my own eyes, but I already felt intimately familiar with it. Just as I had imagined, the sun was beginning to pierce through the hole in the sky behind us. Dark cloud bottoms and patches of deep blue sky were jostling for position above our heads. No matter many cliche, redundant photos have been shot here, I knew I was going to go home with something to feel good about. For the next 20 minutes, the light had a free-for-all. When we first approached, the Mittens and Merrick Butte were in shade, but Sentinel Mesa to the north was illuminated in brilliant late afternoon light. Click, click, click went the shutter on my Canon. Soon light shifted on to the West Mitten and the valley floor below, leaving the East Mitten in shade. I pointed my lens at that world-famous view. Click, click, click. The clouds to the west tensed up a bit, throwing the valley floor into shade but leaving a dramatic spotlight on the West Mitten. It was a special moment, and I took advantage. Click, click, click. A moment later, the fast moving storm clouds re-positioned the spotlight. A strong wind was gusting, but I just kept shooting. Soon the sun went behind a cloud, and a dispersed light dominated the scene, saturating the beautiful color of the sedimentary rocks at our feet and across the valley. I quickly composed a shot with the tilted bedding planes in Ansel Adams rocks pointing to the West Mitten kissed with a “small” beam of sunshine. Click, click, click. The light changed once again, and the south end of the valley was engulfed in a wonderful tension between light and shade. Click, click, click. I turned to the west, and the sun was racing toward the horizon, hidden behind a dense deck of dark clouds. I had a feeling that the show was over. I looked to my Dad and said, “We can go.” He responded, “Okay, it’s your ten dollars.” I was exhausted from the weekend’s adventures and the sun looked to be going to bed, so we headed back toward the truck. I’m pretty sure I had a good smile on my face. We were only there for about 20 minutes, but we witnessed a dramatic an incredibly impressive light show. Regardless of the parking lot, the lamp posts, or how many photos have been taken there, the Mittens are a unmistakable and remarkably beautiful scene. Maybe I came away with shots that are the same old cliches, but I really don’t care. At one of the most beautiful places on the planet, Mother Earth put on a show for me that few people can say they have had the privilege of seeing. I came away with shots that represent to me an incredible experience, and let me tell you, it may have been the best ten dollars I have ever spent.